Some of the most affecting images I have seen emerge from the work of photographers and artists who are coming to terms with the legacy of authoritarian terror in various Latin American countries. I've posted about this work here and here numerous times. With the election of the new pope - Francis I or the Cardinal formerly known as Jorge Mario Bergoglio - today, we confront another deeply troubling aspect of official Catholicism - it's complicity with that authoritarian politics across the continent, but specifically in Argentina. This undated picture popped up on my FB news feed. It is - according to the Portuguese source, Indignados Lisboa, "Foto do novo Papa Francisco I ao lado do ditador argentino Videla." Jorge Rafael Videla was head of the Military Junta that terrorized Argentina from 1976 though 1981. I mentioned him here most recently last summer when he and some of his minions were convicted for some of their more horrendous offenses (like stealing babies from people whom they had tortured, then murdered and selling them). 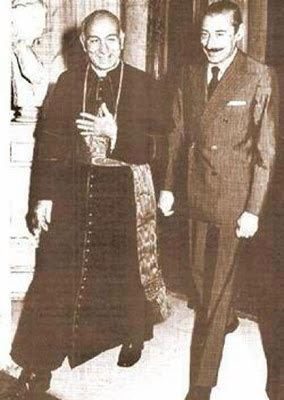 In this picture Videla is accompanied by, you guessed it, Jorge Mario Bergoglio! * The image is symbolic of the interactions between the Church hierarchy and the murderous junta during Argentina's 'dirty war.' There is no real news in this - here is a report from this afternoon and here, for instance, is a report from several years ago, both in The Guardian. What is shameful is that the church hierarchy apparently deems it all irrelevant. * It reminds me of the embarrassing photo of Don Rumsfeld, who under George W Bush supervised the invasion of Iraq, shaking hands two decades earlier with Saddam Hussein. At the time Rumsfeld had been in a functionary for Ronald Reagan (that great supporter of Latin American dictators) who was supplying Hussein with arms.